Instructions: Click here to view a larger photo of this project. My tag size is 5 X 8 3/4". I made my tag by cutting out the dimensions on two pieces of cardstock and gluing them together. Cover with a piece of the paper collection and using Vintage Photo Distress ink to go along the edges of the tag. Add Crystal Clear and set aside to dry. 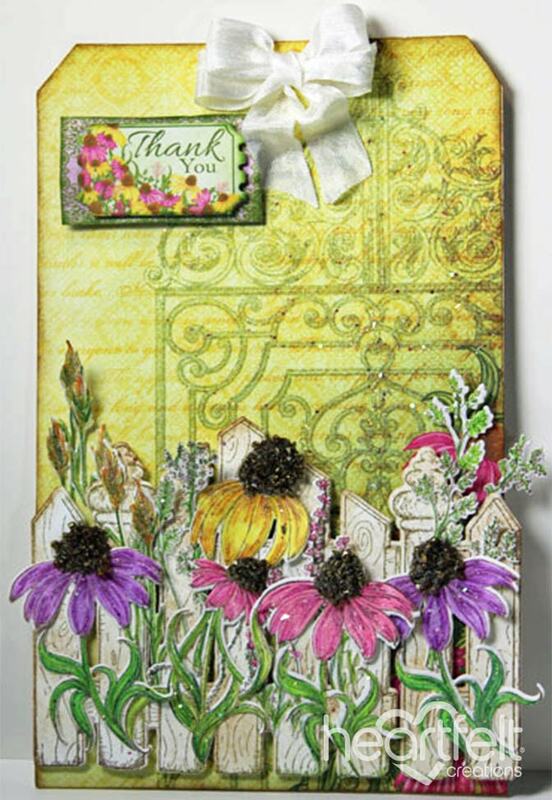 Stamp and cut out the fence and shade with Vintage Photo Distress Ink. Use dimensional tape and adhere to the tag. Stamp, color and cut out the flowers and plants. Add the glitter glitz and set aside to dry. Once dry add some Crystal Clear and again let dry. When the Crystal Clear is dry, decide on placement for the flowers and glue them down. Cut out the ticket and a piece of the paper to back the ticket and using dimensional tape, adhere to the tag front. Tie a double bow and use Scor-Tape and glue to adhere to the top of the tag. The tag is ready to go.